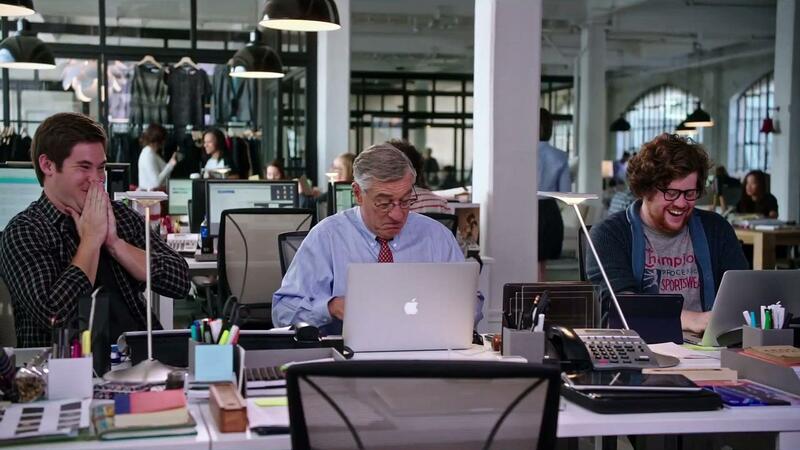 Nancy Meyers is known for making romantic comedies that always explore the ins and outs of relationships at any age. With such movies as The Holiday, Something’s Gotta Give and It’s Complicated, her female roles regularly feature smart women who don’t always understand their place in a new or existing relationship. 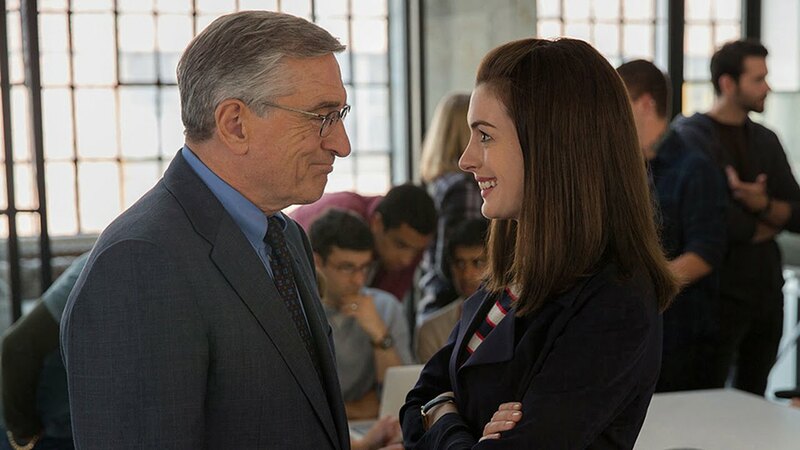 In her new movie The Intern, she takes her usual romantic comedy tropes and places them in a movie about a 70-year-old widowed man Ben Whitaker (Robert Deniro) who tries to get back into the working world via a Senior Internship at an online fashion site under CEO and founder Jules Ostin (Anne Hathaway). It’s part of a community outreach program that Ostin signed off on the spur of the moment. Everything she does is on the fly; she speeds through her Google-like office on a bicycle and sometimes makes decisions without much thought. Whitaker is hired as one of the four interns; he is a current retiree who worked for a phonebook company for over 40 years. His idea of getting ready for work is a lot different than the ones adopted by most people today. He comes in promptly by setting two alarm clocks (yes not iPhone alarms) to wake him up, wears a suit and tie everyday to work and looks sharp as can be for his internship job. To say that he stands out in the sea of guys with zippered hoodies and disheveled hair is an understatement. He is paired directly with Ostin who could care less about her interns. She thinks fast, she moves fast and she is the typical working mom on the go. She barely has time for intimacy with her stay at home husband Matt (Anders Holm), forgets to eat, and on runs on a lack of sleep. Ostin and Whitaker’s relationship evolves into where she starts to learn from him. He’s a man with a million life lessons under his belt and slowly, but surely everyone starts to realize that he is an asset to the company and his co-workers. First off this is not an Oscar-worthy movie; it’s simply a fun movie to watch. I went into this with zero expectations and came out thoroughly pleased. I thought it was an adorable movie; it has its mishaps and corny moments like when Ben and the interns go to Jules’ mom’s house to steal her computer because she sent her a mean email. Scenes like that were a little misplaced and didn’t seem to fit in with the rest of the film. 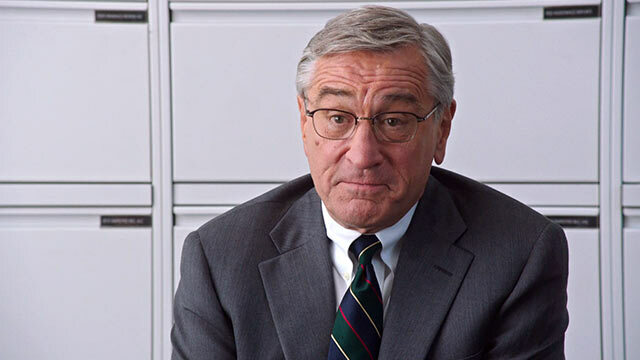 DeNiro steals the film and shows that he as an actor who is now entering a different phase of his acting career, no longer does he have to just play the dad or the old mean mobster guy. In this movie, he is sweet, endearing and makes every 20-something wish they had mentor like him in their life. 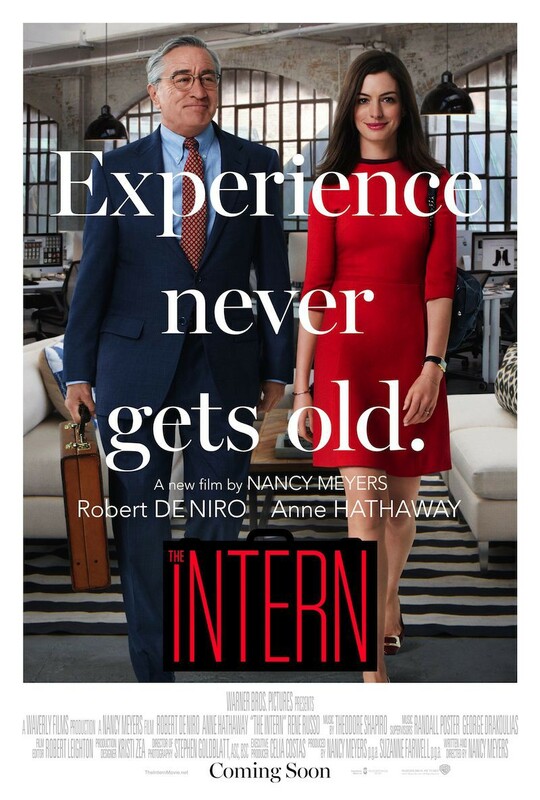 Hathaway was good as well, and she and DeNiro had great chemistry together. I would love to see them in another movie again. I also loved the character of Jason played by Adam DeVine, he always delivers and makes me laugh. I enjoyed the fact that Meyers explored the topic of women in the workplace and challenged the idea that women can lead companies without sacrificing the needs of their spouses and their relationships. It also showed that women can have complicated lives and things don’t always fit perfectly, but somehow as women we always make it work. Overall, a fun movie to watch, it has its funny points and times that made viewers appreciate the older approach to living. If you enjoy the rom-com genre with a twist, then this will be right up your alley. nice to see u back Mel! I agree. A fun little movie with some oddities but worth watching. I wholeheartedly agree with you on this one! Such a nice, little film. Made me feel really good. Thanks so much I agree its a cute film!